Kern Family Farm is a third generation family farm located in Madera County. Hansel Kern’s father established the farm in 1976, and Hansel took over in 2000. In 2010, Hansel’s son joined the business after graduating from high school. Hansel’s wife Sue and their daughter Becky manage The Gnarly Carrot, the farm’s full-service natural foods grocery store. Kern Family Farm consists of an acre of fruit trees, and two acres of vegetables and salad greens including spinach, radishes, brassica and arugula. 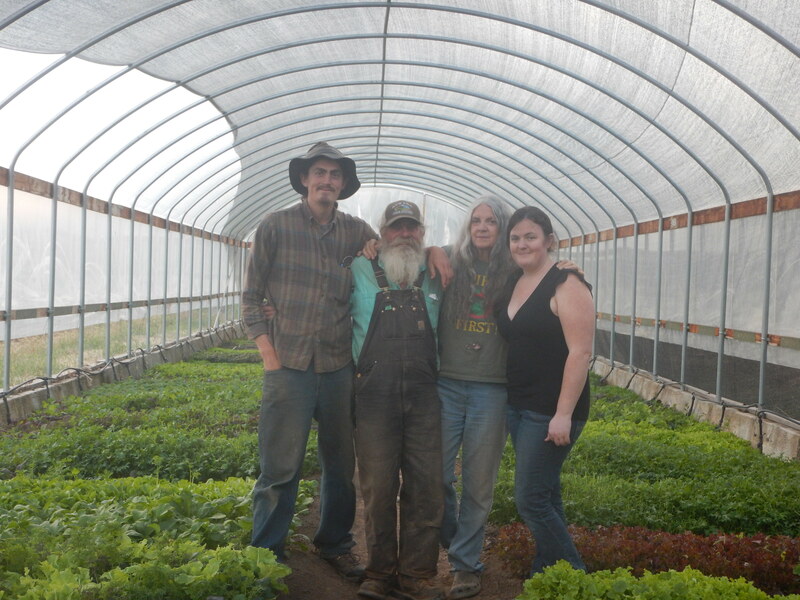 The farm also supplies produce for a couple of restaurants and a North Fork meditation retreat center. Getting enough water to the Kern’s crops is complicated. The property isn’t serviced by aqueducts or reservoirs, so the Kerns must produce their own water supply. One of their sources is a well, and the other is a spring, which serves as an indirect water source as moisture seeps up through the soil. Over the course of the year the spring dries up. The Kerns have noticed that this has been happening earlier and earlier every year. Another challenge is that the farm is entirely off the grid. This means that the Kerns are reliant on cordless tools and long extension cords, and they don’t have access to electricity for water pumping. Finally, squirrels were causing damage to their crops. The Kerns say that when it comes to water conservation, rationing is just as important as storage. They opt to draw only a sixth of their water supply to avoid overdrafting their water table. This means they pump six gallons per minute even though the well produces thirty. The Kerns went from using a solar jack pump to a solar submersible pump, which increased the flow rate. The solar array provides 1500 watts of electricity. In addition to storage tanks, the Kerns use a swimming pool that they drained and cleaned to irrigate the orchard. They irrigate minimally, using a low-flow drip line. In addition, they installed a greywater system that provides water to the fruit trees, and made adjustments to the position of the drip line to better reach the crops. Planting crops more closely together (for example, smaller crops planted amidst perennials) so they share the same drip points helps conserve water. To further conserve water, the Kerns dry-farm part of the orchard, and use cover crops to retain soil moisture. Additionally, the family does not irrigate in the winter and minimally irrigates annual crops. They divert water from the roads to their ponds and ravines in order to recharge their spring. The family is in the midst of a water audit to determine how many gallons of water they are using per plant and per pound of food produced so that they can calculate water allotments. Instead of electricity from the grid and gasoline, the farm uses solar power, a waterwheel and a windmill. The family installed a large spring-fed water wheel that pumps water uphill to a tank and then is used to irrigate the crops below. To keep the squirrels from damaging the crops, the Kerns installed solar electric fencing around each field. The fencing is powered by a 30-watt solar panel and a battery. The last two years have been so dry that for much of the year, the Kerns have been relying solely on their windmill to pump water from a spring below the farm. All of this depends on the wind and water supply and sometimes it’s turned off when water source is low. During the process of getting water to the farm one of the springs ended up downhill below the farm and the Kerns had to get a windmill to send the water uphill and gravity pressure the water up the hill. They surveyed and contoured the hillside and this has reduced the reliance on the waterwheel and the windmill. 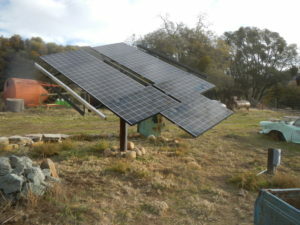 It is expensive to invest in off-grid power and in the beginning Kern Family Farm would use a truck generator to charge the battery while they built renewable energy capacity overtime. A couple years ago before the contour work the Kerns performed a drip line test to see if it would work and decided to replace the pipeline with 1.5” PVC dropped 30’ from the next pipeline after they discovered that 30’ would be sufficient for gravity pressure. The family has been able to keep Kern Family Farm off the grid while maintaining productivity and retaining yields from year to year. The windmill pumped 98,210 gallons of water in 2014, and 100,970 gallons in 2015, averaging about 275 gallons per day. The Kerns have been able to reduce irrigation to twenty gallons per tree per week.